In our desire to stay healthy and fit we of the 21st century have embraced the aerobic approach to achieve this goal. There are many avenues by which this goal may be attained. One of the most popular is cycling. Those who are able and are geographically able enjoy the actual activity of getting outdoors and actually cycling. But, for the average this is not the case. For them, the stationary bike is the answer. Among these are the recumbent exercise bikes. We shall set forth what we think are the best recumbent exercise bikes for 2018. We shall present what we consider the five best of these taking into account their price as well as the tools that come along with them. They will not necessarily be taken in order of best to least good because what is best for me may not be best for you. You will find out what is included in each bike and where you can get it and what some users think of it. After looking at those that are presented, you can decide which one will fit your particular needs. The recumbent bike is a bicycle that puts the rider in a sitting position that is somewhat reclined and gives some support to the back. The weight of the body is placed more on the buttox than on the crotch area. For those who are a little more advanced in age this is a definite must for stationary cycling. By not having to be in a bent forward position the rider can accumulate more time cycling thereby increasing the aerobic benefits. The seat position has also been shown to relieve tension and pressure on the neck, shoulders, arms, hands and lower back. It is true that it is not a full body workout as some other types of stationary bikes are, but it the goal is aerobic, then it is more than achieved using the largest muscles of the body. By attaining aerobic goals you can maintain a healthy body weight and build strength in your cardiovascular system. This along with a healthy diet and regular checkups with your doctor should translate to a long and productive life. We shall begin our list of Best Recumbent Exercise Bikes for 2018 with the Exerpeutic 900XL. Though this bike carries a 300 pound weight limit it only weighs 63 pounds. It has a low center of gravity and has extended stabilizers at each end to minimize movement when working out. The seat is well padded and the pedals are large enough to accommodate a wide range of sizes. Some features include precision balanced flywheel and a V-Belt drive which provide a smooth and quiet operation. This model also comes with heart rate monitoring in the hand grips. It has 8 levels of magnetic resistance providing a wide range of workout intensity. Straps on the pedals prevent foot slippage. It has small transport wheels on the front stabilize make transport easy and convenient. The Exerpeutic 900XL comes with a computer read out which includes the normal categories of distance, calories burned, and time with the above mentioned heart beat monitor. The standard warranty is three years on the frame and 90 days on parts. Shipping for this bike depends on from whom you buy it. We recommend that you buy it from a supplier who gives free shipping. We shall be glad to recommend one HERE. Unless you buy this from a dealer who sells it already assembled(usually much more expensive) there will be assembly required. If you are adepts at assembling things, this will be no problem. Even if not, it comes with easily understood assembly instructions and you should be able to complete the assembly in under 2 hours. 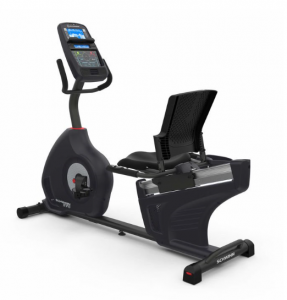 FINAL WORDS: Though the Exerpeutic 900XL is not the Cadillac of recumbent stationary bikes it is a well-built and designed exercise machine that can serve as a workout regimen for many years. The cost is typically under $200 and will give good service for years to come. If working out is a little more serious for you, you might consider the big brother the Exerpeutic 1000XL. For us though, the Exerpeutic 900XL serves as a good foundation for good health exercise. To get the best price click the button. Among the entry level recumbent stationary bikes this one weighs in at a mere 60 lbs. But even at that weight it is built rugged enough to carry a 250 pound rider in exercise mode. Its dimensions are:49″(L)x22″(W)x43″(H). That is very compact. Movement of the bike from one place to another is facilitated by small transport wheels attached to the front stabilizing bar. One of the standout points that the ProGear 555LXT has is the 14 levels of magnetic resistance. 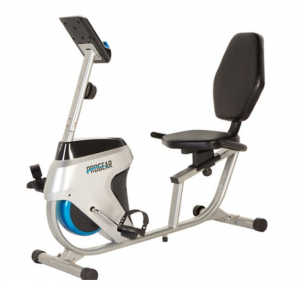 Most recumbent bikes of this price range have only 8 ranges of resistance. Another “upgrade” found on this bike is a programmable computer. With the computer the rider can set his or her goals for distance, speed, or calories burned. The LCD display will display time, speed, distance or calories. A useful addendum to the front setup is a holder for your smart phone or tablet. If you wish to read or watch a utube while working out you’ve got the means to do it. A sometimes overlooked convenience is a water cup holder. Depending on how long your session is, a good drink of water along the way is always refreshing. The seat is adjustable and slides up or down depending on the direction it is moved. It will adjust for heights ranging from 5’0″ to 6’3″ and it is cushioned. It comes with standard over sized pedals and has cushioned grips on the handle bars. It is hard to say anything bad about the ProGear 555LXT considering the price range it is in. It may not be for the professional athlete, but for the common person who just wants to stay in good shape and be healthy, it more than fills the bill. You can check it out by clicking the button. 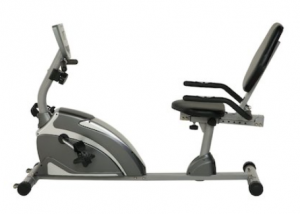 The Nautilus R614 is one of the heavier recumbent bikes. It weighs in at 80 pounds. The only time that will really matter is if you need to move the bike to another location. But the small transport wheels on the front stabilizer makes that easy. The extra weight also makes the bike more likely not to wobble at higher speeds. In addition to the extra weight are added five stabilizing footers which can be screwed up or down to fit to any floor situation. A cooling fan. How nice that is! A nice addition is the table shelf which can allow for your smart phone or tablet to be secured so you can enjoy your TV or YouTube or some other entertainment or study. The workout programs are divided into three groups; Profile Programs, Goal Setting Programs, and Heart Rate Control Programs. Under Profile Programs you have a choice of Challenges, Mountains or Fun Rides. If you choose Goal Setting Program you can choose from distance, time, or calories burned. If you choose the Heart Rate Control Program you feed in your age and then choose which percentage you wish to achieve and then take off. A nice perk for with the Nautilus R614 is the ability to upload your information to NautilusConnect or MyFitnessPal. This is done by inserting a USB stick into your console, then save your data and upload to the site you are working with. For under $500 the Nautilus R614 is one of the best investments you can make if you are serious about loosing weight or maintaining a high level of health. To buy the Nautilus R614 click on the button. 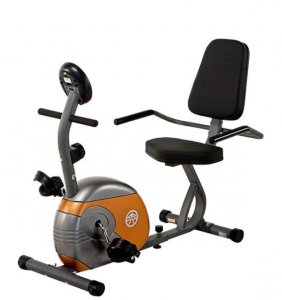 The Marcy Me-709 recumbent exercise bike is another great entry into the under $200 range for exercise bikes. 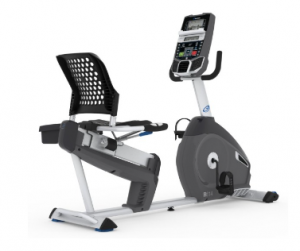 The ME-709 has the standard magnetic resistance of higher priced bikes and incorporates eight resistance levels which enable you to reduce fat and increase stamina as well as improve cardiovascular health. All this is done in the comfort of your own home. It is constructed of heavy-duty tubular steel and is built to last. The high density foam seat makes for comfort and allows longer sessions of exercise. The handle bars are foam wrapped for easy grip and comfort. The pedals have adjustable straps so multiple users can be accommodated. Seat distance can be adjusted for users ranging in height from 5’0″ to 6’3″. The bike also has levelers to be able to stabilize on uneven flooring. The front stabilizer has transport wheels which make it easy to move or store out of the way when needed. The computer read out measures speed, distance, time and calories burned. The default is set to scanning but can be set to one read out when setting goals for time or distance or calories burned. Comes with easy to follow assembly instructions. Depending on your abilities, it will take about 45 minutes to an hour and a half to assemble. If you are like me and only need a daily workout to maintain a healthy heart, this is an excellent bike for that purpose and will give many years of use. Get yours now by clicking the button. I thought I would include one Cadillac recumbent bike for your consideration. 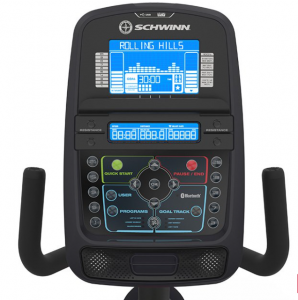 The Schwinn 270 is an excellent instrument for building your exercise program around. It not only provides you with comfort as you do your work out but it provides you with entertainment. One reviewer commented that she had had so much fun in one of the programs that she did not feel as if she had been working out except for the fact that she was soaking with sweat when she finished. The Schwinn 270 has everything that you would want in a work out machine. It has dozens of programs and numerous levels of resistance. It also has Bluetooth connectivity and RideSocial compatibility. Here is a run down of some product features. It has a USB charging port for the monitor. I think you can see why I call this the Cadillac of home use recumbent bikes. Below are a few more facts about the 270. Power Requirements – Plugs into any standard electrical wall outlet on a 110V-120V circuit. 120V 60Hz AC input; 1.5A output. 90-240V, 50-60Hz adapter included AC power adapter included. For all these great features the Schwinn 270 still comes in at under $600. The assembly should take no more than 2 hours, depending on how adept you are at the task. It comes with easy to follow instructions. This bike provides features which come on much more expensive bikes ranging from $1500 $2000, yet it sells for under $600. If you are serious about fitness or just want to enjoy working out for years to come, you should consider the Schwinn 270. To get yours, click on the button. We have presented here five recumbent exercise bicycles that we believe are good investments for the money. The range of price varies as well as the number of amenities. You can weigh the products as to which will fit your situation and finances best. But know that you will be getting a product that will be of service to you for years to come. So, what is the best recumbent exercise bike for 2018? It is the one that fits your needs and budget and helps you fulfill your health goals. I hope that this has been helpful to you in making your decision. Now, go get in shape.